A few years ago, Infiniti raided the performance coupe segment with the G35, a sleek two-plus-two coupe designed to steal sales away from BMW’s 3-Series by means of a more reasonable price tag. It largely succeeded, setting a new standard for entry-level, upscale coupes and forcing BMW to up the ante in the horsepower department. Still, a large chasm exists between the rear-drive import coupe segment and the low-cost domestic coupe segment – a problem Hyundai has recognized and is looking to fill with the Genesis Coupe. Hyundai will tell you it could be considered the spiritual successor to the Nissan 240SX “Silviaâ€ of the ‘90s, a rear-drive coupe for everyday enthusiasts looking to use their car as much for suburban errands and daily commutes as they are for oversteer shenanigans and weekend track day romps. We’re happy to report the Genesis Coupe is glad to oblige in both respects. Aided by its starting point of $22K ($25K for the V-6) and a slew of standard features, it’s hard to call the Genesis Coupe anything other than an outright bargain. Value is at the core of the Genesis Coupe’s appeal, with even the most basic model hitting high on the bang-for-your-buck scale thanks to generous standard packaging. Choice of six different trim levels (seven with the upcoming 2.0T R-Spec) should give the discerning buyer plenty to think about. Hyundai’s 10-year, 100,000-mile powertrain warranty presents buyers with some extra assurance – just don’t mod the engine! Chunky, hard plastics line the doors, lower dash and center console, but at least the upper dash gets some proper soft-touch material. Road noise can be intrusive at high freeway speeds, though not overly so. Blame the fitment of large wheels and tires with narrow sidewalls. Don’t expect backseat adult passengers to endure rides lasting more than a few minutes. From the get-go, the Genesis’ mission statement is clear – it wants to involve the driver. Large gauges that appear to be plucked directly from Mercedes-Benz’s SLK stare you down in the driver’s seat, and despite the oversight of a telescoping steering wheel drivers long of the leg won’t have fitment issues. The 2.0T provides just enough punch, but it’s in the 3.8-liter V-6 that enthusiasts will find delight, the extra power bringing the chassis alive despite the fact that the engine’s power delivery makes it more of a mallet than a sledgehammer. It will still run from 0-60 in under 6 seconds and emits a properly gruff V-6 howl, the manual gearbox providing a solid, connected feel. Turn in is predictable thanks to steering that’s well adjusted, and at low speed the Gen Coupe’s long wheelbase and rear-drive layout make for manageable slides at with a dab of the right foot. At high speed the car understeers resolutely, which will keep overeager drivers from spinning off the asphalt. Track models come equipped with Brembo brakes that resist fade like an IRS audit. The base Genesis Coupe gets a 2.0-liter inline four-cylinder engine with 210 horsepower and 223 lb-ft of torque. A six-speed manual comes standard with the 2.0-liter engine, but those who prefer the car do the shifting can opt for a five-speed auto. A 3.8-liter all-aluminum V-6 is also available, churning out 306 hp and 266 lb-ft of torque through a six-speed manual or available six speed automatic gearbox. All Genesis Coupe models are rear-wheel drive, music to a purist’s ears. Hyundai offers a Track package for enthusiasts, which includes performance goodies such as 19-inch wheels with summer tires hiding Brembo stoppers, stiffened sports suspension, a rear spoiler, fog lights to accompany uprated xenon headlamps and a limited-slip differential to maximize rear traction and Formula D-style tomfoolery. Cruise control, Bluetooth, CD/MP3 stereo with USB/iPod connectivity and steering wheel-mounted controls all come standard. Traction control and stability control are also standard, and require no more than a single touch of the button to fully defeat. A touch-screen navigation system will be available on the GT model this summer. Given that the Genesis Coupe offers a combination of four different powertrains, the numbers for mileage differ slightly from spec to spec. So take a deep breath, here we go. The manual 2.0T nets 21 mpg city, 30 mpg highway and the automatic 2.0T sees each of those figures drop one mpg, while the 3.8-liter manual returns 17 city, 26 highway, with the auto seeing a slight improvement to 18/26. And breathe. Rare in this price range are soft-touch plastics such as those used for the Genesis Coupe’s dash, though the doors and lower dash are made of the more commonly encountered solid, flimsy stuff. A center console close to the design of the Genesis Sedan is also featured, adding a hint of luxury to the coupe’s interface. An aggressively angular front fascia and flared haunches make the Genesis Coupe’s intentions as a driver’s car clear, exemplified by large red Brembo brake calipers on 19-inch wheels on Track models. 18-inch wheels come standard and fill in the car’s wheel wells nicely. With a starting MSRP of just $22,000 for the 2.0T manual, the Genesis Coupe is a performance bargain. The 3.8-liter doesn’t come at too much of a premium either, with prices beginning at $25,000. The key competitors Hyundai benchmarked during the car’s development are the $35,900 Infiniti G37 Coupe and $42,200 BMW 335i Coupe, but the Gen Coupe also competes with cars like the $26,435 Mazda RX-8, $20,995 Ford Mustang and $22,245 Chevrolet Camaro. 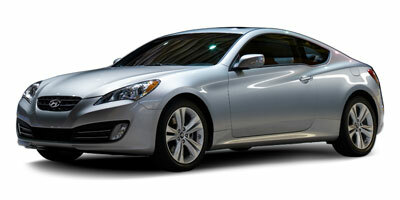 As an overall package, the Genesis Coupe can be considered nothing short of a massive success. Hyundai’s decision to build a performance coupe in the spirit of the drifter’s weapon of choice, the Nissan 240SX, couldn’t have come at a better time. With consumer spending trailing off and residual values plummeting like Soviet-era spy satellites, a new alternative to established luxury coupes is a welcome sight. All hail the new Silvia.